Can anyone imagine an Indian wedding without the tantalizing mehandi? 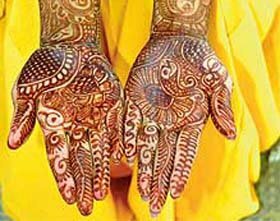 The highly decorative designs on the hands of the bride and on the hands of all the woman folks of the family makes the marriage ceremony very colourful Mehandi is a part and parcel of the Indian traditions from ancient times. Being herbal it has no side effects having a beautiful fragrance and is very cooling to the body. It looks a lot like tattoo without the torture! Recently I read an article in the news-papers that Hollywood has taken to mehandi in a big way! A bride after her marriage steps into her husbands house, taking all his relatives as her own - for joint family was generally prevalent in those days. With so many members in the household cooking and preparing the meals become a big ordeal for the women. By custom, the bride returns after a month for a short holiday to her parents house. . .and mehandi generally should last for quite a while . . .
. . . if it has been washed away then it becomes clear that the new bride has been asked to do a lot of work in her in-law's house! Mehandi is also used widely as a hair colour . . . THE henna-artist is all set to trace a handful of chuckling green flowers on the canvas of your skin. No wonder, you are so excited about the entire exercise. Here are some tips. If you have already applied mehndi, remember not to dip your hands in detergents for long. Also avoid using detergent-based shampoos for washing tresses. You can use a glove in case of an emergency. In case, you have an appointment with the henna-artist, make sure your hands and arms are grime-free before you request him to display his talent on your palms. Also, applying cold cream a night before will only leave your hands supple. Go for it. Again, get rid of the loathsome tan if you plan to get blooming calendulas neatly drawn on your lucid arms. You can take professional help. Or else, take help of the “desi” remedies. You and your friends can get together and call a henna artist to your place. It is going to be convenient, especially if you wish to get the design traced on your feet and legs. Otherwise, request someone to drive you to him. After the henna artist has performed his feat and the henna is dry, apply limejuice after every two hours for the entire day. That’s all folks, happy colouring. A site for henna history and traditions and techniques by Catherine Cartwright-Jones, henna researcher, lecturer, author, and specialist on henna. Designs for the hands and feet. Palms are facinating aspects of the hand. They are already laden with an ancient script. An empty palm a perfect place for symbology.